One of the last two rooms in the basement to tackle is the laundry room. We decided to take advantage of a couple of weeks off over the Christmas and New Year break to see if we could get this knocked out. 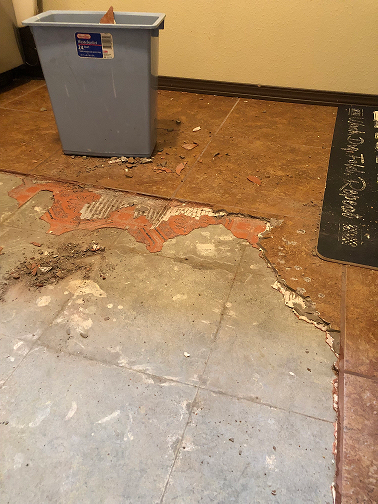 The plan is to remove the current flooring (ceramic tile on top of linoleum tiles) and replace it with the laminate flooring that we've put in the rest of the basement. We're also going to remove the existing cabinets and replace them with something that will provide more functionality for the room (cabinets, some counter space and potentially some bench seating). The new cabinets will not be installed before vacation is over. 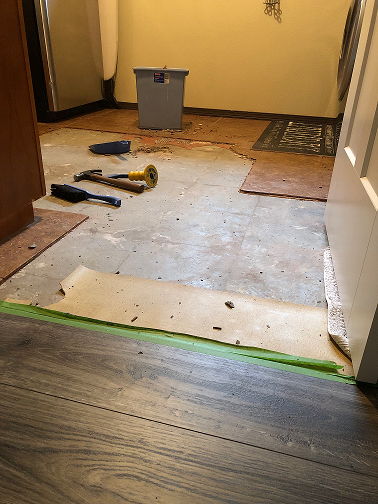 The new laminate flooring from that is in the hallway will be continued into the laundry room - all of the existing cabinets will be replaced and the auxiliary refrigerator/freezer will probably be moved to the garage.